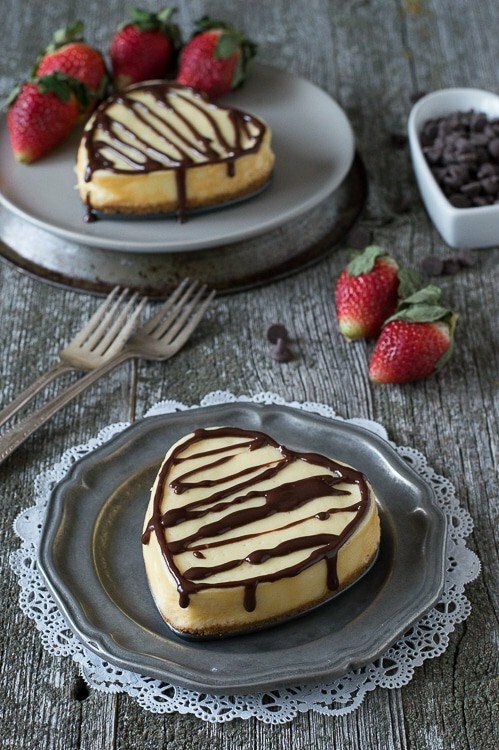 Heart Shaped Classic Cheesecake – a classic cheesecake recipe perfect for Valentine’s Day! 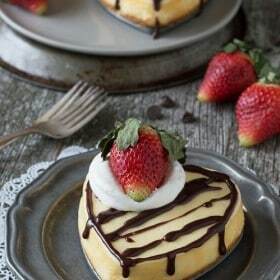 Day three of Valentine’s Cheesecake Week! The last two cheesecake recipes we shared for Valentine’s Cheesecake Week were both no bake mini cheesecake recipes. Today’s cheesecake is the big kahuna – Heart Shaped Classic Cheesecake. 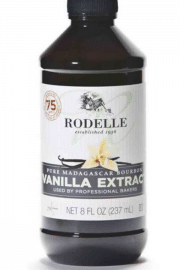 It’s traditional, meaning the flavor is that of a classic cheesecake. There is nothing frilly or over the top about this traditional cheesecake. If you’re looking for over the top I suggest this adorable oreo cheesecake we posted earlier this week. Our heart shaped cheesecake is baked so it has that classic cheesecake texture. I had mentioned earlier this week that I’ve only made baked cheesecake once. In my whole life. Now twice. If you’re like me, I was a bit nervous about making a baked cheesecake because I didn’t want mine to end up with a cracked top or sagging in the middle. If I was going to spend the time making the cheesecake, I wanted it to be perfect. The good news is that you have a buddy (that’s me!) to help you walk through the process of making cheesecake. So get your cream cheese out because by the end of this I hope you’ll have learned how to make a classic cheesecake like a pro! 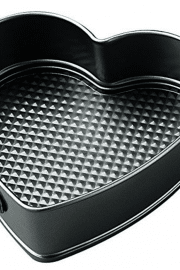 • If you are looking for heart shaped springform pans here are the ones I have. You could also make this recipe using one 8 or 9 inch springform pan or two 4 inch springform pans. If you don’t own a springform pan, you could make this recipe in an 8×8 inch square baking dish and turn the recipe into cheesecake bars. 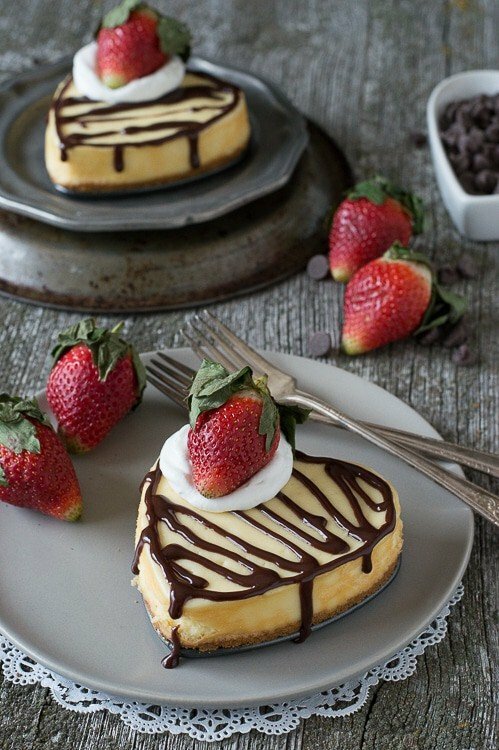 • The cheesecake is done baking when the middle of the cake is a bit jiggly but not sticky when you touch it. Be sure to turn the oven off and open the over door but leave the cheesecake in the oven for 30 more minutes. 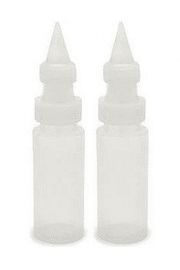 This will help the cheesecake set. After 30 minutes, remove the cheesecake from the oven and will it to sit on a cooling rack for 30 more minutes. After the cheesecake has cooled a second time, then carefully remove the springform pan. Use a small knife or flat spatula around the edges of the pan to help release the cheesecake. Pre-heat the oven to 400 degrees F. Place the graham crackers in a food processor or blender and pulse until they are crumbs. Melt the butter in a small saucepan. 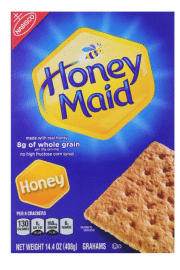 Once melted, combine the butter and graham cracker crumbs in a bowl until the mixture is thick. Lightly coat the heart shaped pans with non-stick cooking spray. Place 4 tbsp of the graham cracker crumb mixture in the bottom of each pan and firmly press into the pan with a spatula. 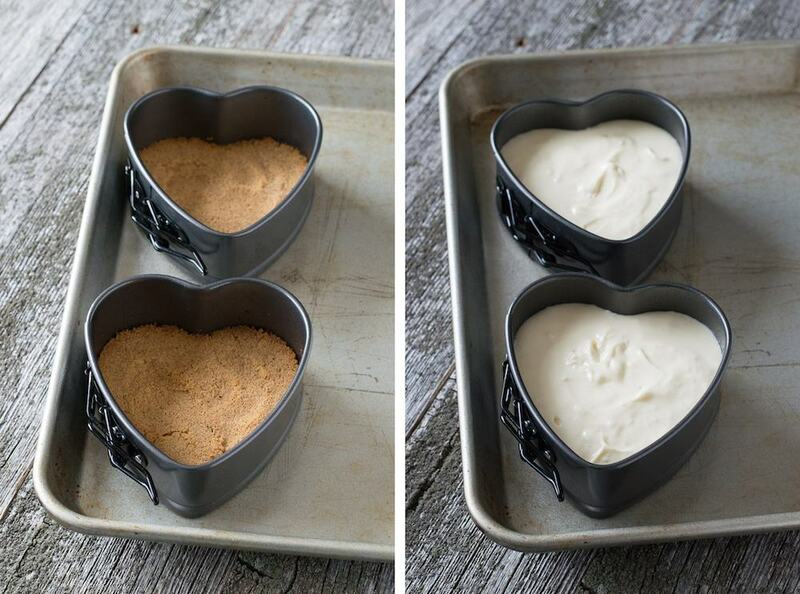 Place the heart pans on a baking sheet and bake for 7-8 minutes, until the edges begin to brown. 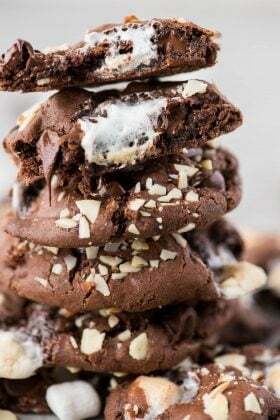 Remove the pans from the oven and turn the oven temperature down to 325 degrees F.
Combine the cream cheese, sugar, and vanilla in a mixing bowl, and beat using an electric mixer until fluffy. Add in the egg and beat until incorporated. Evenly divide the cheesecake mixture between the two pans, lightly shaking them back and forth to make the cheesecake smooth. Bake for 25 minutes, or until the middle is a bit jiggly but not sticky when you touch the top. Turn the oven off and leave the door open and allow the cheesecakes to sit in the oven for 30 minutes. After 30 minutes, remove the cheesecakes from the oven and let them sit on a cooling rack for 30 more minutes. Carefully remove the springform pans, refrigerate the cheesecake until you’re ready to serve them. 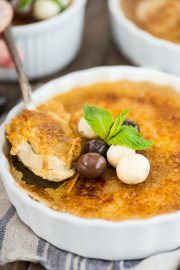 In a small sauce pan over low heat, combine the chocolate chips and heavy cream. Stir occasionally until everything is melted. Allow the chocolate to cool so it’s not too runny. 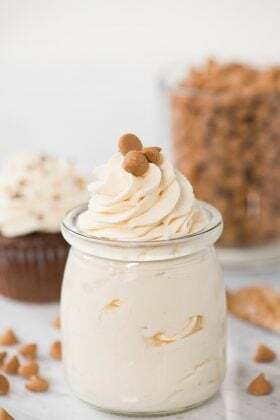 Transfer the chocolate to a squeeze bottle or ziploc bag with one corner cut off and outline the cheesecakes with chocolate and drizzle more chocolate in the middle. 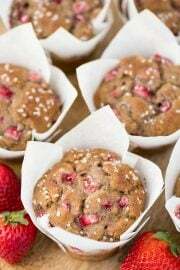 Before serving drizzle with chocolate and add a dollop of cool whip and a strawberry. 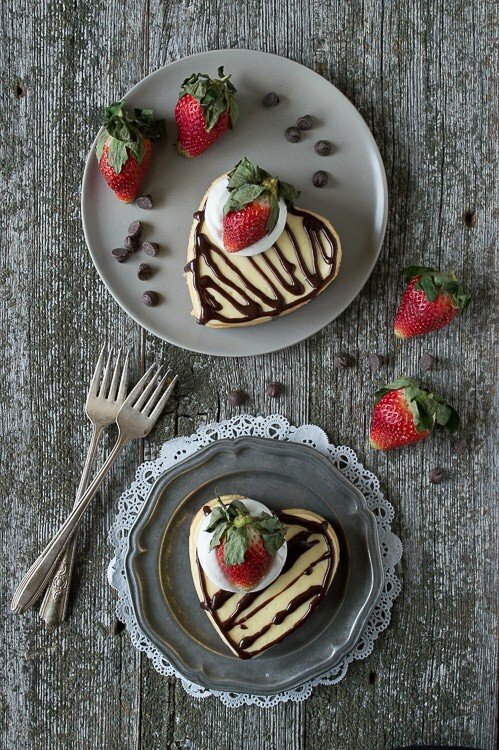 My husband’s birthday is two days before Valentine’s Day and his favorite dessert is cheesecake – this is perfect! That is perfect! Let me know if you make them! 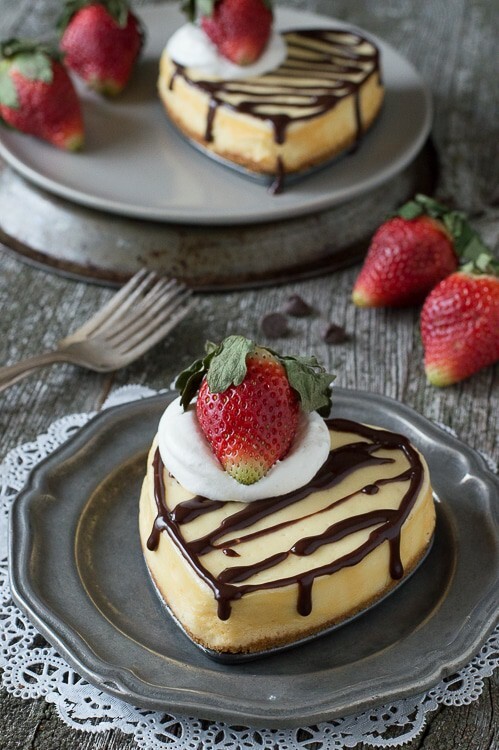 I’ve always wanted to make a heart shaped cheesecake! Your photos are gorgeous. Pinned! Get some heart shaped pans after they go on clearance next week! These are the absolute cutest dessert ever, Beth – I’m in love! I’m such a sucker for heart-shaped foods – especially when they look that delicious!! Pinned! I am a sucker for heart shaped food too Lauren! Thanks for pinning! I am in love! I love classic cheesecake, other flavors are fun too but it is awfully hard to beat a perfect plain cheesecake! It’s always good to have a classic cheesecake recipe in your repertoire! I love that you own heart shaped springform pans!!! 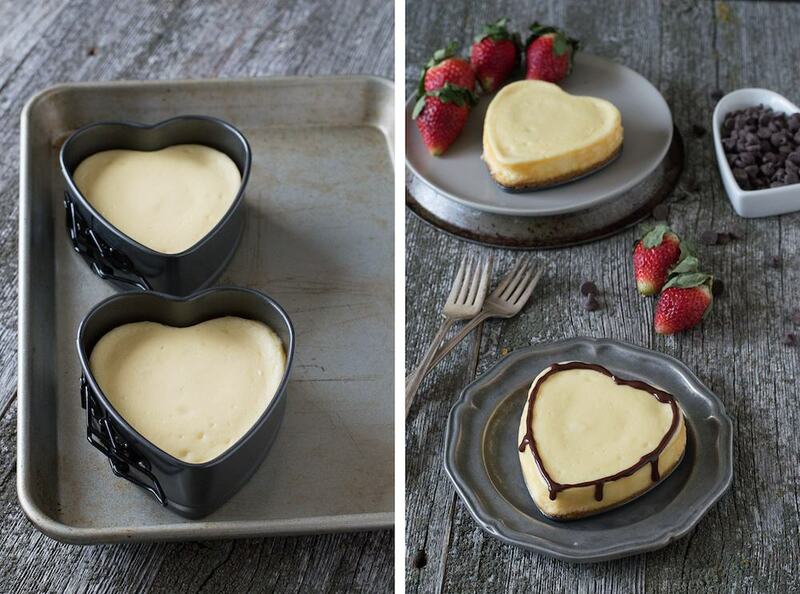 So much cuteness to be made… These cheesekcakes look perfect – what a fun and special Valentine’s day treat! Hahaa, I did buy them specifically to use them for a recipe! I pinned your recipe. I like the idea of making a small recipe since cheesecake is so rich. I kind of cringe when a recipe calls for 4 packages of cheese. I always think that is 2 lbs. of cheese – holy cow. I know, 4 packages is so much!! I love these mini ones! I actually still have these same heart pans from back in college. 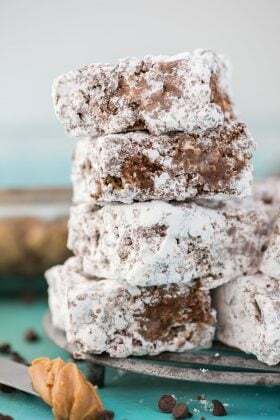 I need to dig them out and give this recipe a try! Haha, woohooo!! Dig them out! Everything you have made for Vday has been downright adorable perfection! I can’t stand it! I want you as my baking buddy! If my husband could make this for me for Valentine’s Day, I’d say that it would be the best present ever! These look amazing, Beth! These look perfect, Beth! I love a good classic cheesecake! I love heart desserts! These are just so adorable!! It gives me a good reason to bust out the heart pans too! Hahaha, who wants to share dessert on the best day of the year?! These are the cutest little cheesecakes! I must get some heart shaped springform pans ASAP! I bet they’ll be on sale after this weekend! These are beautiful Beth! So fun for Valentine’s Day! Lindsay! I had a great idea, you should make a heart shaped 3 tier cake!!! Hi Kristine! 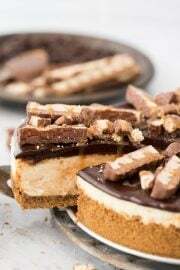 It’s possible to do, but it would be a very thin cheesecake, not tall like traditional round cheesecakes! I just wanted to give my readers options since many of them do not own heart shaped spring form pans.